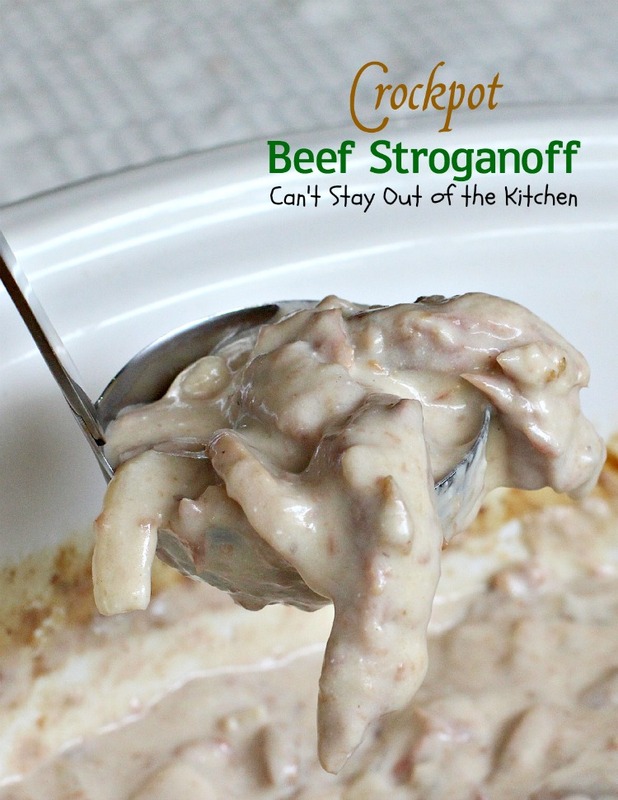 Crockpot Beef Stroganoff has been a family favorite for decades. Years and years ago, way back before we had children, we were invited over to the home of our church administrator and his wife. John and I were in our very early 20s and Al and Vicky Cartwright had teenage/college-age children. 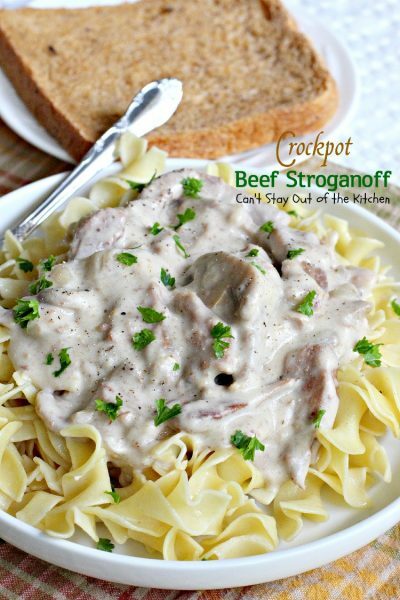 Vicky served this delicious Crockpot Beef Stroganoff recipe and it has been my go-to recipe time and time again. I’ve made this recipe literally hundreds of times. I don’t even tinker much with the ingredients because it is good as it stands. My kids and husband always loved this dish especially because we served it over noodles. It’s also a great main course to serve for company. 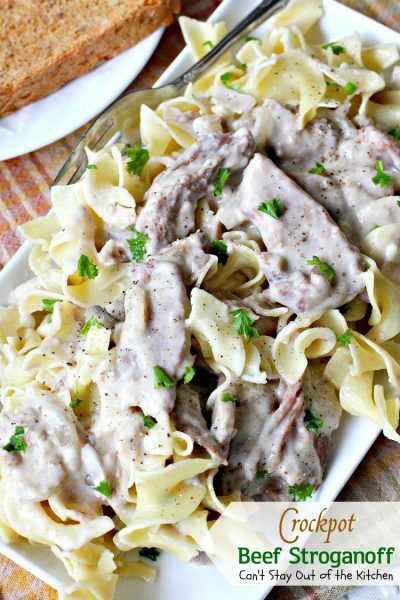 It’s so easy–you just dump everything in the crockpot and let the stroganoff cook. Serve over noodles, duh! Seriously, this recipe only takes about 5 minutes of your time and about 5 hours in the crockpot and it’s ready to go. I can do QUICK! I can do EASY! I can do TASTY! 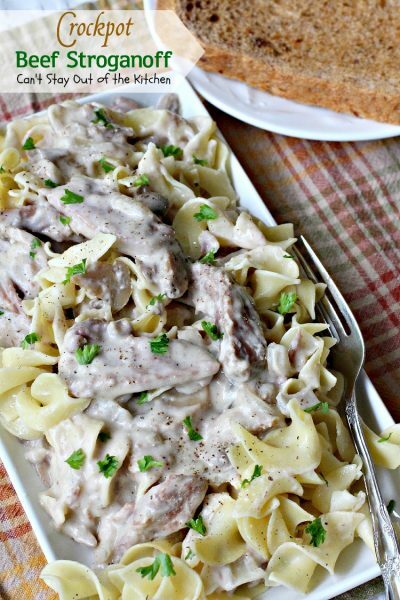 The great thing about this recipe (other than it tastes great) is that it takes so little time to prepare you can take the time to prepare other casseroles or desserts for your meal that are more involved and not have to worry about timing issues and getting everything done without being over-cooked or under-cooked! If you’re looking for a quick and easy Crockpot Beef Stroganoff recipe you won’t have to look any farther than this. You will love this mouthwatering and delectable entree. Every bite is filled with lots of beef, mushrooms and onions and cooked in a savory, appetizing sauce. I’m drooling as I write this! While I didn’t make this recipe gluten free since I was making it for a young mom with a newborn baby, you can easily substitute gluten free flour in the sauce and gluten free noodles. When I first published this recipe in March 2013, I had just purchased my new Canon camera but I was too chicken to use it – and finally got enough lessons about three months later to begin. Consequently, all my first year recipes were taken with an inferior iPhone 3 or 4 camera lens. Grainy, blurry, dark. Not appealing at all! I’ve been going through and remaking all those recipes and this one came up for remake (August 2015) when another young mother in our church had her fourth child. I made up a batch of this appealing entree and had her daughter tell me a couple of weeks ago (September 2015) that she loved all the food I brought to feed their family, including this! By the way, I’ve used stew beef, sirloin sizzlers, and this time I pulled a couple of steaks out of the freezer and used that. Because it slow cooks, the meat is always tender no matter what cut you use. Crockpot Beef Stroganoff is comfort food at its best. This close up shows the beefy texture. Our children loved this entree when they were growing up. We served it frequently. Spray your crockpot heavily with cooking spray. Measure out flour. Dredge your meat with the flour. 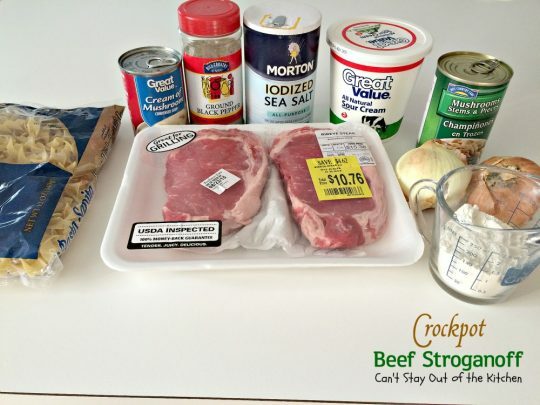 I’ve used sirloin sizzlers, round steak, stew beef, New York strip steak, rib-eye–all kinds of cuts for this recipe. 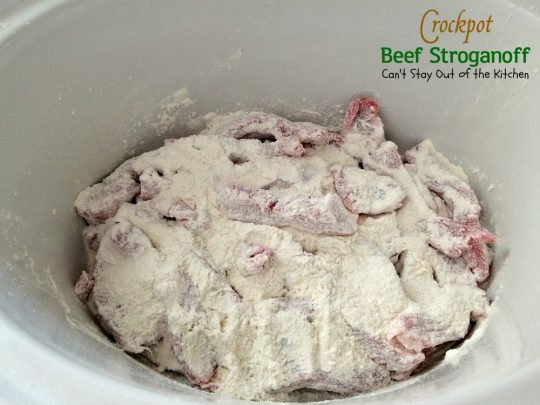 Toss floured beef into the crockpot (along with any other flour you don’t use). Slice onions and separate into rings. 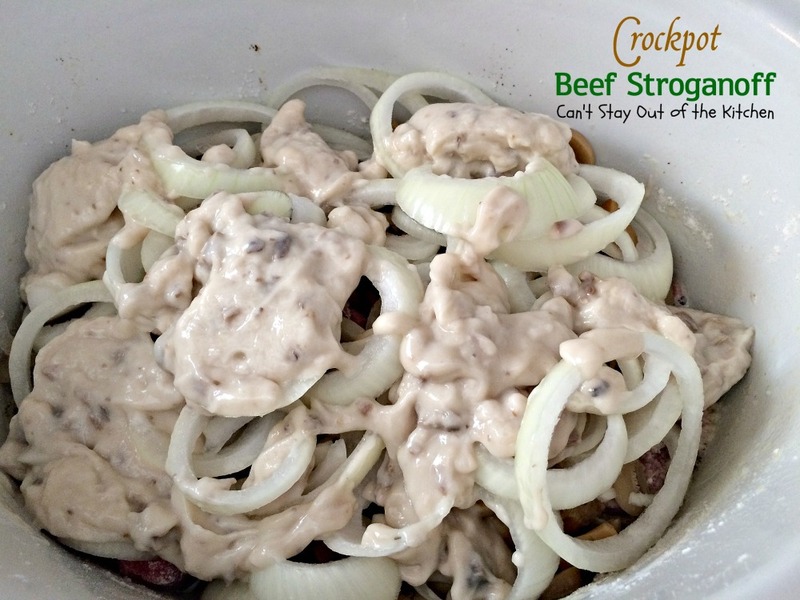 Toss the onion rings into the crockpot with the beef. Add mushrooms – I usually add the whole can — water and all – but if you prefer your recipe less soupy then drain the mushrooms. Add a can of cream of mushroom soup. Add about a quarter cup of water and swirl it around in the can a little to remove extra soup. Pour into crockpot. Add salt and pepper. Stir all the ingredients. Cover with crockpot lid and cook on high for 4-5 hours or low for 8 hours. This really cooks down a lot — you will NOT need any additional liquid. Here’s what the stroganoff looks like after 4 hours on high. Add sour cream and stir to combine. 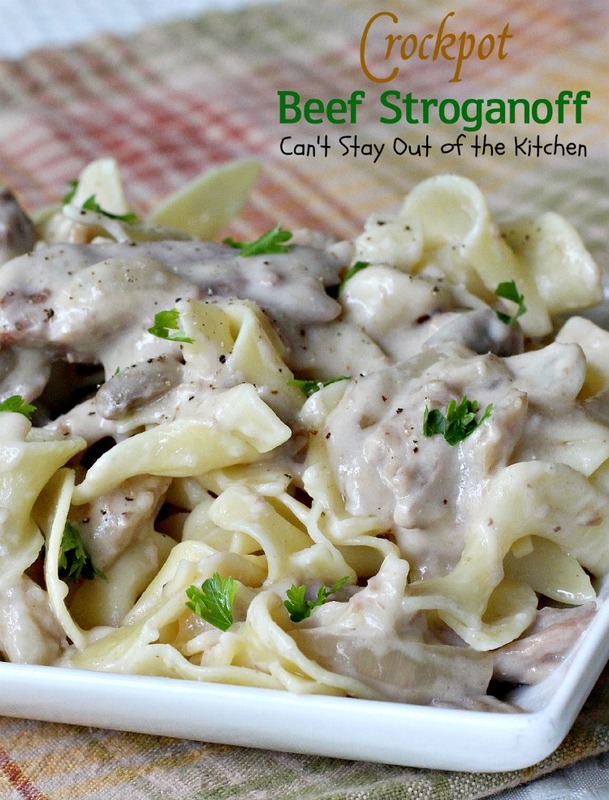 Crockpot Beef Stroganoff is wonderful served over noodles. Here’s a ladle of the stroganoff. About 20 minutes before the stroganoff is done, bring a large sauce pot of water to a boil. Boil dumpling noodles according to package directions. Drain. Add a little butter or olive oil to the noodles to prevent sticking. 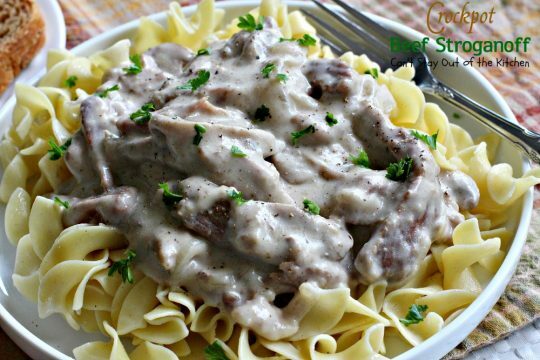 Ladle stroganoff over top of noodles. Sprinkle with salt and pepper and fresh parsley, if desired. To serve: Place a serving of dumpling noodles on your plate. Top with a ladle full of Crockpot Beef Stroganoff and enjoy! Delicious main dish using stew beef, onions, mushrooms, mushroom soup and sour cream served over noodles. Easy crockpot recipe. Cut steak into small strips or pieces and roll in flour. Put floured beef in crock pot and add salt and pepper. Add all other ingredients EXCEPT sour cream. Cook about 4-5 hours on high or 8 hours on low. Add sour cream just before serving. NOTE: If you prefer a thicker stroganoff, drain the water from the mushroom cans. The recipe will still cook down fine. If you prefer a thicker stroganoff, drain the water from the mushroom cans. The recipe will still cook down fine. 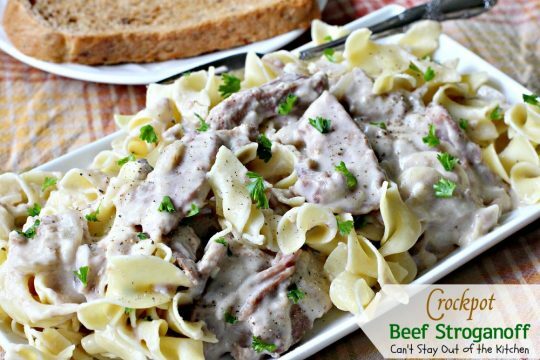 Crockpot Beef Stroganoff is elegant enough for company, but your kids are going to want it for their every day family dinners too! This mouthwatering meal is SO easy to prepare and yet the beef tastes so succulent and wonderful — as if you’d been toiling in the kitchen for hours! 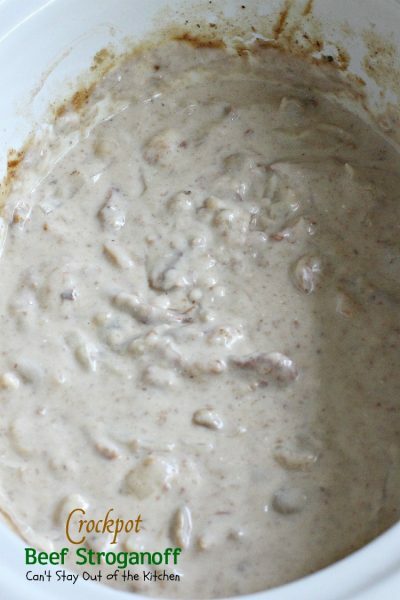 If you prefer a thicker stroganoff omit the water from the mushroom cans. 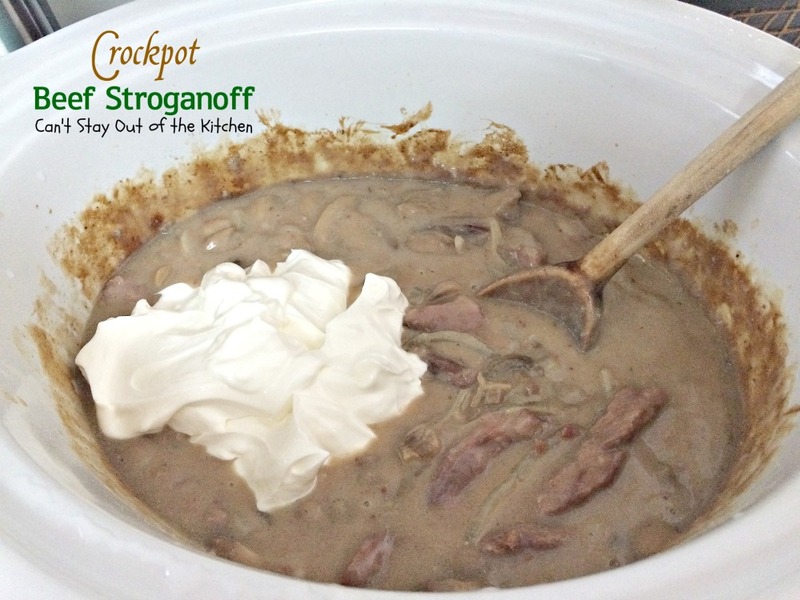 Even though the mixture seems dry when you put it in the crockpot it all cooks down.